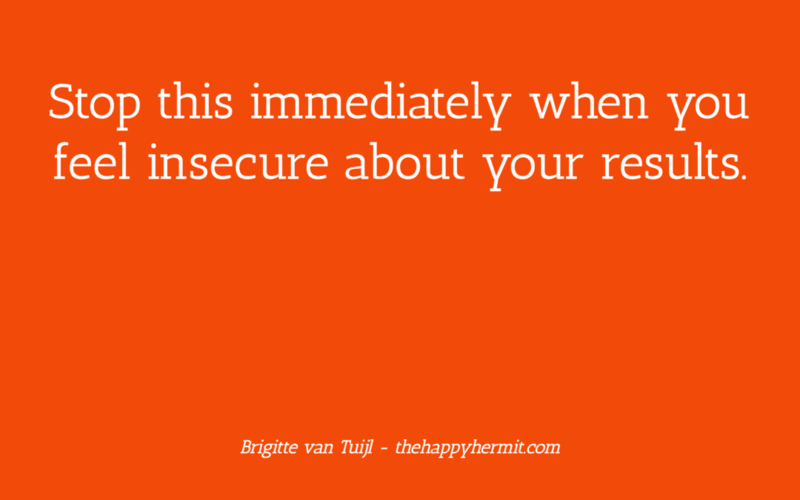 Stop this immediately when you feel insecure about your results. I see many women doing it – and sometimes fall into this trap myself as well. You see someone having a successful launch with a program similar to yours – but when you launched your program, only 2 people signed up. You read that someone went from zero to 6 figures in one year – while you’re in business for 5 years now and still struggle to make ends meet. You see people living the happy laptop-lifestyle in gorgeous locations – while your office is also your laundry room / bedroom / living room. It makes you feel small, sad, and leaves you wondering what’s wrong with you: why can’t YOU create things like that?! If you ever find yourself doing this: stop it. Immediately. It only brings you down. What currently unfulfilled desire wakes up in you when you look at other people’s business and life? What do you see them do, be, or have that YOU want to do, be or have, too? Use this as information to get super clear on what you REALLY want in your business and life. How COULD I create it? How CAN I make this happen, too? Commit to your dreams and be ALL in to achieve them. OWN your power. You’re not insignificant. You’re not small. And you’re most definitely not a failure or a loser. You’re a powerful creator with limitless options and opportunities. You’re a spark of the divine. And you’re capable of so much more if you decide to go for what you truly want, and don’t let any fears or doubts hold you back. Stop comparing yourself to others, and focus ALL your energy on what you most want to create. What other people create is their business. What you create is your business. There’s plenty of space for everyone’s success. And finally, remember that you don’t know what anyone’s business or life truly looks like. You don’t know what other people struggle with. You don’t know how hard they had to work to get to where they are today. So, stop looking at what others are doing – unless it inspires you. If not, bring your attention and focus back to where it belongs: on what YOU choose to experience and create. Keep your eye on YOUR dreams, baby! P.S. : Your inner blocks, doubts & resistance are the ONLY thing standing between you and whatever it is you most want to experience or achieve. Clearing those blocks is all you have to do to live your DREAMS instead of your fears. It’s not always easy to cut through your own crap or heal your own inner turmoil, though. That’s why I created RISE, my online membership program for women entrepreneurs. RISE gives you the tools, clearings, (healing) energy, mindset & support to transform and let go of your inner crap, so it no longer holds you back from whatever it is you TRULY want to do in your business & life. You can read all about & sign up for it here. You get access to the bonuses, this month’s topic & energy (April 2017 topic: Owning & Embracing Your FULL Power), and all previous materials within minutes after your purchase is completed.